This is my second nonfiction book for older readers, and like The Yellow-Lighted Bookshop, it takes a personal and historical look at a very common place: the classroom. Most of us spend a good deal of our lives in classrooms, and the lives we live there shape who we are, who we will be. I'm tracing the history of schooling here—from the history of textbooks and desks to sweeping educational theories—but I'm also looking at what happens each day in the classroom, examining how we learn because of where we learn. Can you remember your first day of kindergarten? "...an important and humane perspective on what happens to us as individuals as we engage in education." "Though this appears to be a nostalgic memoir of a baby-boomer's education from kindergarten through high school, Buzbee's affectionate account turns out to be a subtle, sharply etched critique of contemporary public education...Deeply affectionate toward teachers, harshly critical of budget cuts, the book offers an eloquent, important reminder (which in a perfect world would inform policy) about the nature of school." "Elevating the thinking around school improvements, from the nuts-and-bolts ideas to a broader view...Buzbee spreads engaging prose across the pages, providing both a reminiscence of better days and a considered examination of the assumptions we all make about what does—and does not—constitute a quality education." 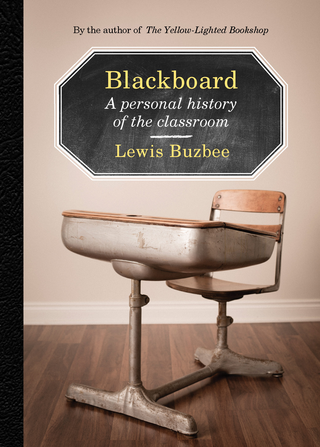 "From the perspective of former student, teacher, and parent, Buzbee offers a keen look at the politics, economics, and sociology of how school has evolved and the history of school developments from textbooks to writing tools to blackboards interpersed with his own visceral memories of nap time in kindergarten and learning to read and calculate. This is a loving and probing look at the social and emotional meaning of school." "Displaying the same passion he exhibited in The Yellow-Lighted Bookshop, his love letter to bookstores and the art of bookselling, Lewis Buzbee here melds a fond memoir of his own education with snapshots of the history of American pedagogy....Whether Buzbee is meticulously inventorying the contents of a desk that contained both troll dolls and a toothache-inducing assortment of candy or fondly recalling My Little Red Story Book (the volume that launched him on his passionate reading life in 1963), he's a capable guide whose observant prose is well suited to the task of stimulating our own memories." "The first day of school was a simple but ritual occasion in my childhood home," writes Buzbee at the beginning of his heartfelt non-fiction ode to learning. Buzbee knows the arc of the last half century in California's school system as a former student, as the father of two students and as a teacher. He revisits his classrooms, describes the dilemmas parents face at each stage of the educational system and, most importantly, shows how badly America is failing today's students. He tells of his teacher Mrs Jouthas, who asked him for a five-page report on The Grapes of Wrath, and how reading Steinbeck was the beginning of a life dedicated to writing. Buzbee compares his education in California, when he was nurtured and sustained by teachers, to today's defunded public schools, where parents are fundraisers for even the most basic supplies. I've had many opportunities to stop by Bagby Elementary, but, preferring instead drive-by washes of memory, it's been decades since I've set foot here. Today, however, after lunch at her grandmother's, my daughter Maddy calls out from the backseat that she wants to take a closer look at my old school. Why not? she says. It's a deep Indian Summer Saturday, warm under a thin plane of rooster-tail clouds sliding in from the west. The light of the shortening afternoon is golden and purple at once, and scarlet Liquidambar leaves blanket the neighborhood's orderly grid of lawn and sidewalk. This is ideal back-to-school weather, at least to me. Here in the Santa Clara Valley, fifty miles south of San Francisco, the first rains have not yet returned after the bone-dry summer, and the scented air—a sharp, nearly acrid decay—tells me that school is back in session. As a child I was at best an average student, never an over-achiever, and most Septembers the loss of summer's broad freedoms seemed an incomprehensible punishment, but even so, the lure of school's return never failed to send a thrill through me. Whether I was drawn by the crush of the schoolyard and all the other kids who would be there, or unknowingly craved the structure of classes and relief from seemingly infinite summer, or simply recognized the fitness of the world's turning through time and space, no matter how loud I grumbled, the return to school was momentous. The first day of school was a simple but ritual occasion in my childhood home. After a special breakfast of Eggs a la Goldenrod, my mother and father would stand at the front door—thrilled that summer was over for them too, I'm sure, but also because they respected and promoted the value of school for their children—and I would march off into the rich Indian Summer morning. I smell that promise again today; my skin crackles with a deep and familiar charge.